Last month we hosted the British Engines Annual Awards Evening 2018. We celebrated those who have worked within the company for 25 years, and the high achievers from the British Engines Apprenticeship+ Scheme who are developing their engineering career in the north east. The HT Lamb Award is presented each year to the apprentice who has shown to be a dedicated individual, and who has gone above and beyond to prove themselves as capable engineers. Named after the company’s founder, and the current Chairman’s Great Grandad, the award celebrates the success of our future engineers. This year’s deserving winner, Adam, won the award for his consistent hard work and his ability to ambitiously develop and adapt to new situations over the duration of his apprenticeship. Adam began his apprenticeship in 2014 at Rotary Power, one of British Engines’ seven engineering businesses, with hopes to become a CNC Machinist. Adam quickly demonstrated that he was a skilled worker and soon expressed his interest in working in a service role, commissioning and testing products, which led to a change in the direction of his career. Here, Adam talks about winning the HT Lamb Award, what it’s like to study an apprenticeship in the north east and about being offered a permanent position within the British Engines Group, which will allow him the opportunity to study a degree in Mechanical Engineering. Congratulations on receiving the HT Lamb Award, what would you attribute to your success? I’ve always worked hard, ever since I began my apprenticeship with British Engines, and even before that. So I guess that would be why. I was always ahead with my work and I never took my foot off the gas. I’ve enjoyed the variety of the experience. When I first started, I rotated around different areas of the business. This is when I showed an interest in the service department rather than CNC Machining, which is when I made the change in direction. The company was more than happy to let me change, and were supportive of my choice. That’s the good thing about the British Engines Apprenticeship+ Scheme. You get the opportunity to try a bit of everything and doing that can open up new possibilities that you may never have thought of. What are the benefits of the Apprenticeship+ Scheme? I only studied the Apprenticeship+ Scheme for a year. I already had my BTEC from studying at college, so British Engines enrolled me onto my HNC course earlier than those I’d started my apprenticeship with. However, the Apprenticeship+ Scheme gives you the opportunity to gain additional skills that you wouldn’t normally gain with a normal college apprenticeship, such as experience in project planning; focusing on vital academic skills such as maths that you wouldn’t get on other courses, and other additional skills like welding. What has your apprenticeship taught you that will be useful in your future as an engineer? My apprenticeship has taught me not to be presumptuous and to always be organised. It’s taught me to prepare for the outcomes you don’t expect; especially when going onsite to work with a client, which can often be unpredictable. It’s also helped me to refine and develop my skills. I was recently offered a permanent engineering career in the north east as a Trainee Design Engineer for Rotary Power, part of the British Engines Group, which is where I was based while I carried out my apprenticeship. As part of the role, I’ll be studying a degree in Mechanical Engineering. So in five years’ time I’ll have my degree, which I start this September, and after that I’ll be a Design Engineer. I hope that in the future I’ll eventually go on to a management position. And finally, what would your tip to other apprentices be? I found managing time carefully was a key factor to making life considerably easier during my apprenticeship. I always tried to stay ahead when it came to completing NVQ and further education work, especially if you’re lucky enough to be afforded the opportunity to do your HNC. Don’t wait for the time when assignments are due to be handed in, because it’s nearly always a time when you’re busy at work and struggle to find the time. 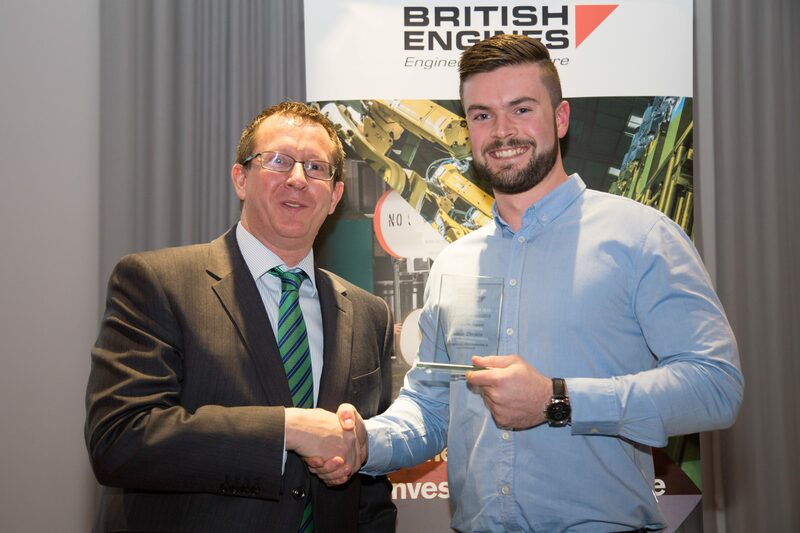 We’d like to take this opportunity to congratulate Adam, once again, on his recent success in winning the HT Lamb Award and securing his permanent position within the British Engines Group. We wish you all the best for the future, Adam! To take a look at some of the pictures from our recent awards evening click here. Alternatively you can take a look at how to apply for our unique Apprenticeship+ Scheme starting in 2019, please note that applications for our 2018 intake of apprentices are now closed, or browse our current vacancies.